Sunshine and Vitamin D – How winter can be more than just cold! Sunshine is a rarity around this part of the world, especially for my friends up in Scotland. It is, therefore, imperative that we all make good use of the sunlight while it is around us. Why? The body makes vitamin D when exposed to ultraviolet B (UVB) rays from the sunlight. The benefits of vitamin D are many, with it promoting the absorption of calcium and phosphate from food intake, and is essential in the formation of bones and teeth. Vitamin D has also been found a vital nutrient to help control asthma, prevent high blood pressure, multiple sclerosis and ward off Parkinson’s disease. A deficiency in vitamin D can lead to a failure of the bones to grow, and causes rickets in children and osteomalacia in adults. Vitamin D is also believed to play an important role in regulating cell production, that may have an effect on reducing breast, colon and prostate cancers. Lack of vitamin D can also lead to lower lung function which means lesser control over an asthma attack. The nutrient also plays a role in strengthening nerve cells, which get affected in Parkinson’s disease. Most vitamin D is made by the body when the skin is exposed to sunlight, although some comes from oily fish (tuna and salmon), milk and cereal. Vitamin D supplements can also be taken. Although sunlight is the main source of vitamin D production, exposure is also a risk for skin cancer, and you are advised to use sunscreen after a few minutes in the sun. The amount of exposure required to generate adequate vitamin D also depends on where in the world you live, and what time of year it is. It goes without saying that you will need extra sources of vitamin D in the winter months other than sunlight, especially if living in the most northern parts of the northern hemisphere. The intensity of UVB rays is also reduced by clouds, pollution and glass, so sitting next to a window will not provide enough sunlight to make vitamin D.
As previously mentioned, increased exposure to sunlight can increase the risk of skin cancer. The use of sunbeds can also cause skin cancer. Both sunbeds and the sun emit UV rays (UVA and UVB), that penetrate deep into cells and can cause gene damage, triggering skin cancer. Many experts support the notion that sunbeds should not be used as a method of tanning. If you would like advice on nutrition, it may be worthwhile coming to see us at Atlas Osteopathy (with clinics in East Finchley and Moorgate, as well as the option of home visits), where we can explain your problems to you, why they occur and whether or not you are suitable for osteopathic treatment. Often this can be done via email or on the phone. Compression Socks – What is the fuss all about? Long distance travel can be a luxury and a wonderful experience, if you have plenty of money to throw about and travel in style. If, like most of us, you are not so fortunate, it is important to develop good habits and take care of one’s posture. According to research carried out by myself and Evexar Compression Advisory Ltd, the average person travels for around 400 hours a year, the majority via car, including an average of 10 hours a year on a plane. The human spine was designed to balance stability and mobility, allowing us to move, whilst keeping us in one piece. When the spine is immobilised for long periods of time, such as when sat in the car or on a plane for over an hour, forces through the spine concentrate onto one particular area, in the lower back. 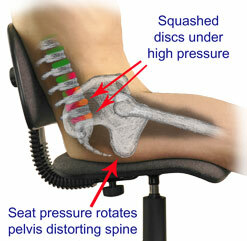 This excessive force causes strain to the intervertebral discs. The spine goes from an ideal posture, to a poor, pain-causing posture. 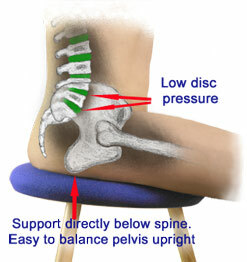 The use of a lumbar support cushion, or lumbar spine brace/belt can aid in the prevention of low back pain. Alternatively, if possible, it is important to get up, move about and stretch both the back and the legs, which can help a person avoid the second problem of ankle swelling and its’ complications. Any prolonged time spent sitting down will reduce blood flow back to the heart, known as venous return. This will cause blood to pool in the lower limbs, visibly seen as ankle swelling or oedema. This why following a long-haul flight, many of us will notice swollen ankles when we take our socks and shoes off on arrival. This ankle swelling also increases the risk of forming a blood clot or deep vein thrombosis (DVT), which is a blood clot in the deep veins of the leg. This is because the rate of blood flow slows down, increasing the chance of the blood clotting, and logically, the longer the seated, inactive period, the greater the risk of a DVT occurring. DVT also has complications in itself, with the risk that the blood clot may dislodge, travel back towards the heart, blocking a blood vessel on its way, or potentially in the lungs, which is fatal. Therefore prevention of such occurrences is very important, and a few methods are outlined below. DVT can potentially be caused by dehydration, but more likely by immobilisation. Therefore, it is important to increase water intake and decrease alcohol and caffeine intake when travelling. Leg, particularly calf muscle, contraction exercises are important to increase blood flow back to the heart. Compression socks have been found beneficial in studies with regard to promotion of venous return and DVT prevention after surgery and after travel. If you are about to travel or have suffered with low back pain/ankle swelling in the past, it may be worthwhile coming to see us at Atlas Osteopathy (with clinics in East Finchley and Moorgate, as well as the option of home visits), where we can explain your problems to you, why they occur and whether or not you are suitable for osteopathic treatment. Often this can be done via email or on the phone.